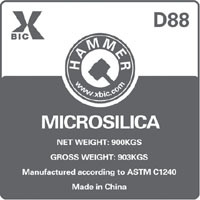 Hammer ® - Microsilica D88 is a very fine pozzolanic material, composed of amorphous silica produced by electric arc furnaces as a by-product of the production of elemental silicon or ferro silicon alloys, which can be used in a variety of cementitious products such as concrete, grouts and mortars, and meets or exceeds the specification of ASTM C1240 and EN 13263: 2005. All information in this publication is in accordance with our present experience and knowledge. However, since we have no influence on the way in which our products are treated and used, we cannot take any responsibility in this respect. The user must assume responsibility himself for checking whether the products are suitable for the purpose and use proposed by him. All existing proprietary rights, laws and regulations shall be observed.